PTron, one of the fastest growing quality mobile accessories brands in India, has launched its ‘InTunes’ – Sweat-proof magnetic Bluetooth earphones for the Indian consumers. Loaded with some of the best features, InTunes offers the finest audio quality and connectivity through its Bluetooth v4.2+EDR as it enables the user to connect PTron InTunes with two smartphones at the same time. It also connects faster than most other Bluetooth earphones at this price point. The sweat-proof ear-buds ensure comfort, convenience and extend the longevity of the device. Available in 3 eye-catching color options – Gold-Black, Grey-Black, and Red-Black, InTunes is light-weighted, ergonomically designed and sweat proof. 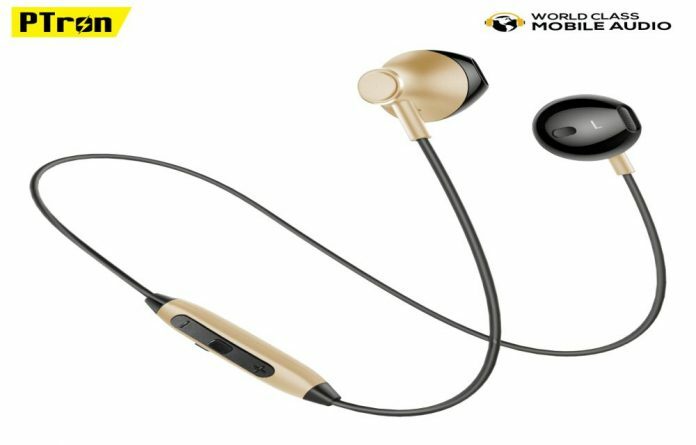 It comes with the in-the-ear secure fit design which ensures maximum noise reduction to enable the user to hear crystal clear voice/music with 14.2 mm drivers. It provides 10-meter connectivity and is backed by a long-lasting 70mAh Li-Polymer battery providing long 100 Hours of standby time with just 1 hour of charging. The metal ear-buds with magnetic attraction help wrapping the earphones around the neck making it convenient to carry. ‘InTunes’, with world-class audio quality, has been specifically designed and developed keeping in mind the audio requirements of sports lovers, fitness fans, keen travelers and business commuters who prefer high-performance microphone for a convenient hands-free experience. It best suited for a user due to a remote control to manage calls/listen to music with the push of a button without interrupting user’s work in the office or home.